The last couple of weeks have been really great, and the days are just flying by, in a good way. The weather is beautiful, the pace is nice, and there is plenty of downtime for doing other things here in the rig. We did see a small spike today in traffic as they are taking down the work-over rig, but nothing major. And we finally got some solid info on the schedule. It turns out there are numerous wells in this area, but only two fracking crews. So you have to wait your turn for them to show up to start the fracking process which is what is causing the delay. That’s great for us, of course, and there is a very good chance we will go all the way to the end of our tour here before they start the frack. Since we have a list of things we want to do before we leave, it’s extra good news. This always happens to us when we stay in one place for awhile. We have a list of things we want to get done and about two weeks out we are like, “Oh crap” we better get on that! Nothing too serious, but we like to take care of as much as we can on non-travel days. I had an opportunity today to catch up on some friends’ blogs and wanted to point out an excellent one written by MNDrifters. They have been on the road a little longer than we have, and like us, they have to work as they go. They have done some jobs we have never done, most recently working in a parking lot at a festival. It’s a brutally honest account of their experience (we have it much easier in comparison at this job), but it is also very funny. Dino keeps a sense of humor about this stuff, which I admire. If you like reading accounts of peoples’ work kamping experiences, and I can’t imagine you would be reading this if you didn’t, I absolutely recommend checking this post out. I woke up today feeling like I had slept in a pillowy trench. When we first hit the road, we took out the RV mattress our rig came with and replaced it with our very expensive pillow top mattress we had at home, and then added an additional pillow top mattress cover. After a while your body sort of mashes the filling down and form a you-shaped “dent” in the mattress cover, and this becomes uncomfortable to me. The only way to fix it is to wash the cover, but since it is so big it won’t fit in our Splendide washer/dryer combo. As a general rule I am not a big fan of going to the laundromat, but since I had the complaint I volunteered to go. I also took the sheets and our comforter and headed into Dilley. It turned out this was one of the nice ones! It had newer machines, a very clean tile floor, and a person on staff. The other folks using the machines were very nice and it only took a little more than an hour to wash and dry everything I had. We are signing the tax documents and going ahead and paying the bill. Some people wait until the last minute, but I would rather have it taken care of. I have also dedicated an hour a night to watching Project Management educational videos and hope to earn 10 Professional Development credits before we leave. I am also spending some time preparing for my call with Michelle Sagara, my favorite author. We are scheduling that call for this week and I am really looking forward to it. I have my list of questions prepared and have gone back and looked at several books and short stories. I have read all of her books repeatedly, but I didn’t want to freeze in the moment, so I have reread some of my favorite parts. I also downloaded and tested Google Hangouts, as that is the application we will be using to talk and I wanted to make sure I didn’t have any technical difficulties. We have exchanged some emails last week and she is extremely nice, which has made me feel much more confident about the conversation. I just want to be prepared so I can learn the most I can from it. I am also spending 1-2 hours a night working on our story. I was having a rough time with it a few days ago because I felt like I was being too negative, but I talked it through with Lee and am back on track. It will be a companion piece to the blog which has lots of the good stories in it, but in order to provide a balanced view I will need to retell some of those stories. Originally I was focusing on filling in the gaps, especially during the time period when I was working my corporate job and could not talk publicly about what was going on, but as important as those stories are it’s also important to talk about the good stuff that is on the blog. So now I am writing first, then reading the blog from that time period, and adding in what I think is relevant and rewriting it. It’s kind of a weird process actually, because although I can relate to myself two years ago, in some respects I have changed so much I have a totally different perspective. Currently the way I am handling that is to include some excerpts from the blog and forum posts from that time period to “honor” my then-self’s point of view, but I am not sure how readable that will be in the long run. But it is just a first pass, and the most important thing is to capture my thoughts and feelings, and then I am sure I will need to do a major rewrite. That will be new for me, but writing this blog is largely a one-two draft process. Lee does his grammar-spelling-humor-injecting proofread of course, but I rarely go back and rewrite unless it is a particularly difficult subject. On a few rare posts I have rewritten 4-5 times, but I find I make major changes every single time which is concerning. That is one of the things I want to talk to Michelle about, actually. Hopefully her process will give me some clarity. Finally, I have made available a printed version of my recipe book. My mom wanted a hard copy, so I worked through the various steps to make a hard copy using Kindle Publishing. It is available on Amazon here if you are interested. I did want to explain a bit about how this worked because the price is a little on the high side at $16.99, and I wanted to explain why. Blurb provides publishing but because they specialize in trade books and photography books, they are a high quality publisher. A soft cover from them would have cost me $41, which was ridiculous. So I started looking at Kindle publishing and if I had a PDF they could make a paperback for me. I had to go back and buy the PDF from blurb, which only cost $4.99 but it was a static point in time. Every rewrite, or version would cost me an additional $4.99, which I am not willing to pay, so I am pretty locked in. Once I uploaded the PDF I had to select a format size and soon ran into issues because I couldn’t just “go back and change the PDF” as they recommended without paying additional money. Long story short, I ended up with 8 1/2 x 11 1/2 size because that is the only thing that worked with my current formatting. The size of the book determines the base printing cost (along with the fact that I needed color print on the inside for the pictures) and in this case the cost is $8.13. That’s not awful, indeed much better than Blurb’s base price, but Kindle forces you to add 60% on top of the publishing cost and they take all of that. In order to make any royalty at all I needed to add an upcharge and that’s where the price became too high. So here is how it breaks down: If you buy the iTtunes version of the book I make around $6, the Ekindle version of the book I make $4, and the hard copy of the book $2. It’s not so much the change in royalties that bugs me, but being forced into certain pricing structures certainly does. But hey, it’s totally my fault as I obviously didn’t do adequate research on all this up front. In order to hopefully avoid these situations in the future, Lee downloaded Adobe’s InDesign software for me (it’s part of their Creative Cloud suite we already pay for, I just never used it) and I will be trying to use that as my foundation going forward. The major benefit of course is the ability to create my own revisions and new PDF’s at will. As far as self-publishing, that is going to require some research. There are lots of companies out there who help with that and although I may ultimately not find a better deal it certainly won’t be for lack of trying! 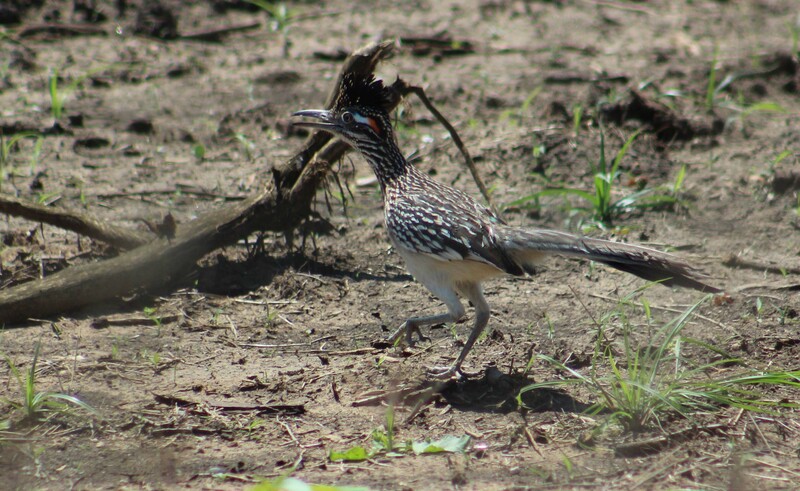 I’m very excited because I finally got a shot of the road runner coming right up to the gate! Actually now there are a mated pair and it’s been really nice watching them together. Lee saw the male “hand” the female a moth this morning so they are either courting or nesting in the area. I was just excited that they are finally comfortable enough to allow me to get some pictures. Lee was standing less than 10 feet from the gate when the female came up and as long as he didn’t make any sudden movements she was fine. That was the big excitement for the day as traffic is extremely slow and will probably stay that way until the end. I did want to take a few moments though and write about a webinar I watched last night. I have a pretty large library to choose from on projectmanagement.com, and I stumbled across a topic that was of interest to me, so I watched that one. The title was “Coping Strategies for Bullying in Project Management” and it ended up being an excellent webinar. (As opposed to the much less popular “Bullying Strategies for People Coping With Project Management”, for advanced users. – Lee) I am not a huge fan of the word “bully” because it brings up images of childish behavior in the schoolyard, but bullying in a work environment can be quite different. Paul Pelletier, who gave the presentation, is a lawyer and project manager who experienced bullying first hand to the point where it had a serious impact on his health. Since that experience he spent a considerable amount of time researching the psychology of the issue and developing coping strategies. We all have dealt with bullies, and many of us, myself included, have even been guilty of it a time or two. Just because we are no longer working in a corporate environment doesn’t mean we will never have to experience it again, and I thought the information was so good that I wanted to pass some of it along. It’s outside of what I normally write about, but since we have experienced it while working on the road I definitely think it is relevant. Paul defines bullying as repeated abuse and disrespectful behavior ( from eye rolling to verbal or even physical aggression). It’s deliberate, and always for the benefit of the bully. Some people jut have a bull in a china shop personality, which is unfortunate but it is not bullying unless it is deliberate and personal. The most common behaviors you will see are aggressive communication, manipulation of work such as excessive micromanagement or overloading a person with tasks, and sabotaging of work; stealing ideas or withholding pertinent information so a person can’t succeed. As Paul said, “Bullies are laser focused on a campaign of interpersonal destruction.” That is a dramatic way to state it, but anyone who has been on the other end of the experience knows that is absolutely true. One of the most interesting parts of the presentation for me was when he talked about what motivates a bully. Unlike when we were children, the workplace bully doesn’t typically target the weakest person. Rather, the bully goes after people who he/she perceives as a threat. The targets are generally skilled workers, well liked, teachers or nurturers, and ethical and honest. The reason these people are targeted is because they are everything the bully is not, and by undercutting their confidence and undermining their position the bully rises in social status and power. The problem is, bullies are often high performing, and their bullying gets results. So if you are working in an environment where short-term results are all that matters (like say a temporary/seasonal position), bullies are often allowed to flourish because they get results, but there are rarely any long term consequences for the person above the bully, so they get the results without the cost. If the company takes a more long-term view though, they understand the cost of bullies, which includes reduced quality of work and losing talented people. Finally he talked about dealing with bullies, and this was actually a little depressing. He started by saying that you need to be realistic and understand the work culture, which often supports this behavior. The things you can do though, and I think all of us who are full timers will definitely agree with this, is stay healthy. There can be serious health side effects to long-term exposure to this behavior and your health should always come first. He also recommends minimizing your contact with the person and making those contacts be as impersonal as possible. Good advice for me because I always want to fix it. He feels you cannot reason with a bully and you certainly can’t fix them, but you can protect yourself. The best piece of advice that may work is when the behavior first occurs, stand up for yourself. Bullies will sometimes move on to other targets if you make it difficult for them, but that action must be taken in the early stages of the relationship or it has no chance of working. That really resonated with me, because I tend to take a wait and see attitude and hope things will get better and that is exactly the wrong approach. “Be courageous, but calculated,” according to Paul which is an excellent piece of advice. This entry was posted in Lakeside and tagged Bullying in the work kamper environment, Road runners, Work kamping Gate Guarding. Bookmark the permalink. Like you, I think I’ll skip festival flagging! Pretty humorous account though. When you finish your next book, you will have lots of experience from the cookbook to draw on. Everything is a learning curve. There are bullies in all walks of life! From the playgrounds to the “old folks” home! I think Paul is right, they have to be dealt with early on. 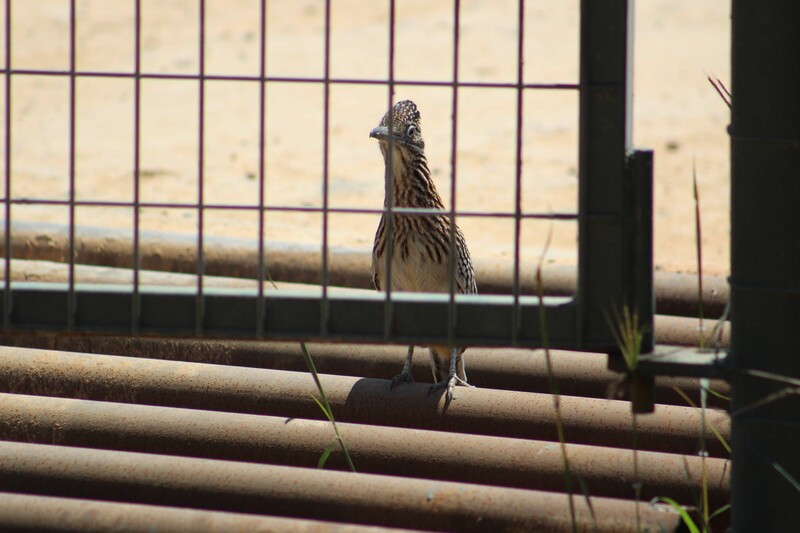 You can train your roadrunner to come up close to you and eat raw hamburger. Had a fella on a gate once who would imitate the clicking noise they make and a half dozen would appear to eat hamburger he had placed on the porch. As you know, they are voracious carnivores and will eat a rattlesnake in a second. I like them around for that reason. Nice. I did not know that. Very cool.